As everyone knows, the Colorado Weather saying goes, "If you don't like the weather, wait five minutes and it will change". This couldn't be more true as we often experience multiple seasons in one day. And as much as we wish we could control the weather, we only have control over your next best option. During your planning process, we work with the couple to formulate backup plans in case of rain or cold weather. This helps eliminate any additional stress on the day of the wedding. We just convert to the next plan that works best for the situation. We are firm believers in option B and C.. we know what your option A is, and we hope that weather cooperates and we can execute your first choice for your wedding day, however there are different factors that come into play with weather. First you must consider what is too much rain? What is too cold? Is wind the absolute deal breaker to move inside? Your plan B may be a tent if it is just a little rain, but if there are high winds that are just out of hand your only choice may be inside the building, this is plan c.
One common backup option is to put up a tent on the grounds, giving you outdoor surroundings with plenty of coverage from the elements. The Barn includes our beautiful tent equip with draping and market lights in all of our venue pricing and we keep this up year round. This is typically our plan c for last minute weather changes. We need little notice to switch a ceremony into this tented space. The walls open for a west mountain view, and we have heaters for warmth. Wind however is a factor with tents, as it is noisier, and if the rain is torrential, then the ground may hold puddles. A great option for light sprinkles and snow and always here as a back up to consider. While a tent might not be quite what you had in mind, it can be a versatile option acting as a blank canvas to meet your theme and achieve the outside vibe you want. Tents also come with clear side and top panels, allowing for unobstructed, breathtaking views. "And if you don't need to use them because of clearing weather, they can be pulled back and tied to the poles, making it look like part of the overall décor plan. The tent doesn't always have to be plan b, it may have been in your vision all along. We love to use our tent as a shade during cocktail hour with all walls pulled back, or for some late night dancing with a romantic overhead. At The Barn at Raccoon Creek, we have multiple alternative locations available to you to host the perfect wedding. 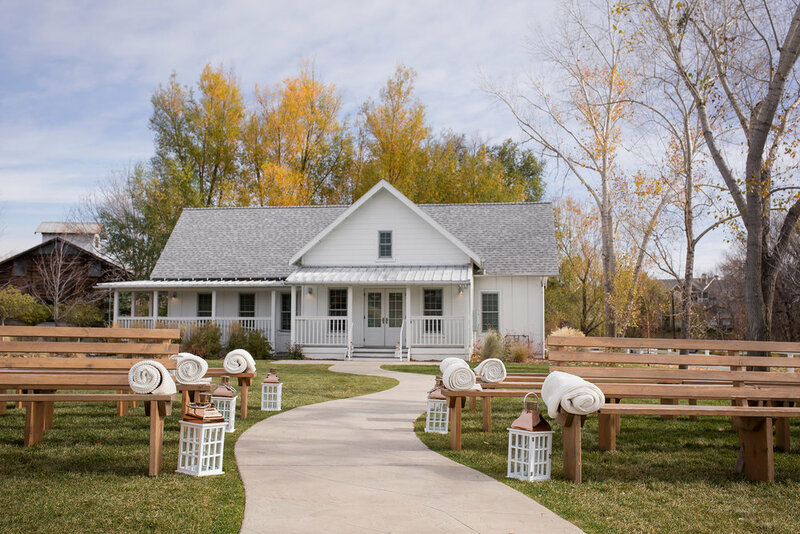 We have our Ceremony Lawn, the Cocktail Courtyard, our white Tent, and of course the reason you picked Raccoon Creek to host your wedding, The Barn. The most common way to flow from ceremony to cocktail hour, then to reception, is to have your ceremony in the lawn, followed by cocktail hour in the courtyard or tent, with your reception inside the barn followed by dancing. -The most common way is a "room flip". This means that the ceremony was planned to be in The Barn all along- so either a Plan A decision, or a day before Plan B decision. If this is the case we will use our chiavari chairs to create the perfect aisle for you to walk down from the sliding barn doors. Your tables will be set up to the side of the room where they can still be decorated in advance, and when you say your I Do's, we will send your guests to the tent to enjoy cocktails as we "flip your room" for dinner and dancing. -If you plan on having your ceremony outdoors and last minute the weather decides to downpour and you just really cannot envision your ceremony in our tent, we will make sure to help move your ceremony inside The Barn. If this is a morning decision we MAY be able to move the tables to the side of the room and create an aisle as in the scenario above, however is this is a scenario where we do not have much notice an hour before, this is a last minute plan C decision in which the room will not be adjusted much from set up. If the time is limited, your guests will sit at their already set up tables, and you will be able to still have an aisle to walk down towards your hubby! We have our mobile arbor we will bring in and help redecorate, and we will do what is in our power to help keep your wedding vision a reality. As is often true in the summer, rain showers can move out just as quickly as they move in. This is very true especially in Colorado with our temperamental weather. The best option in this case is to wait out the weather for as long as possible. Of course we must be cautious with time as the rest of the order of events will be affected. You must decide which is most important- having your ceremony pushed back to be outside, or cutting cocktail hour and dancing time down. At this point we will give you a last call time in which we will have to make the decision if we are using a plan b or c option or toughing out the weather and keeping the ceremony outside. -Set up the tent with a lounge area and some tables with seating. -Open the bar early to entertain guests while we wait out the rain. Another great way to keep the outdoor party alive is to simply warm things up. Unexpected cold snaps happen, but that's no reason to head indoors. You can always prepare by bringing outdoor heaters to warm the area and creating fire pits for casual guest seating. Add some mugs of hot chocolate or s'mores as a late-night treat and guests won't even notice the nip in the air. There are also great companies like Weather or Not Accessories where you can rent bulk amounts of umbrellas, shalls, or blankets where they will deliver these items to you, and you aren't spending a large amount of money on something you may not end up needing, and wanting to keep over 100 of each. Depending on the severity of the weather, the good news about unexpected weather day of, is most of your guests should have prepared with coats and umbrellas, and ceremony's tend to be short and sweet where we can tough out the weather and quickly allow your guest to gather in shelter in the tent with heaters for a cocktail hour. Ultimately if you are prepared to have the ceremony rain, snow or shine, they will be too. You can ensure of this by sending out an email or note on your wedding website. Remember that you get to have the day that you want, and even if weather is a predicament the final decision is up to you and it will work out how it is meant to be.